Interactive installation. 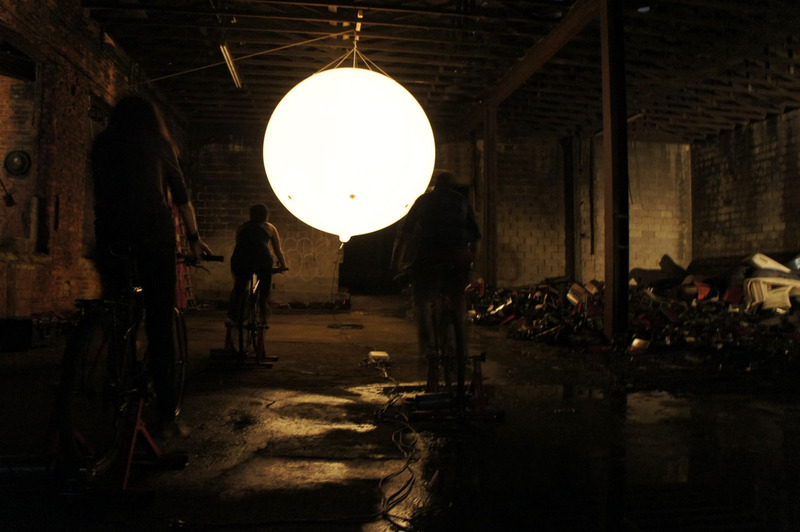 Modified bike trainers, bicycles, cables, balloon light and muscle power. 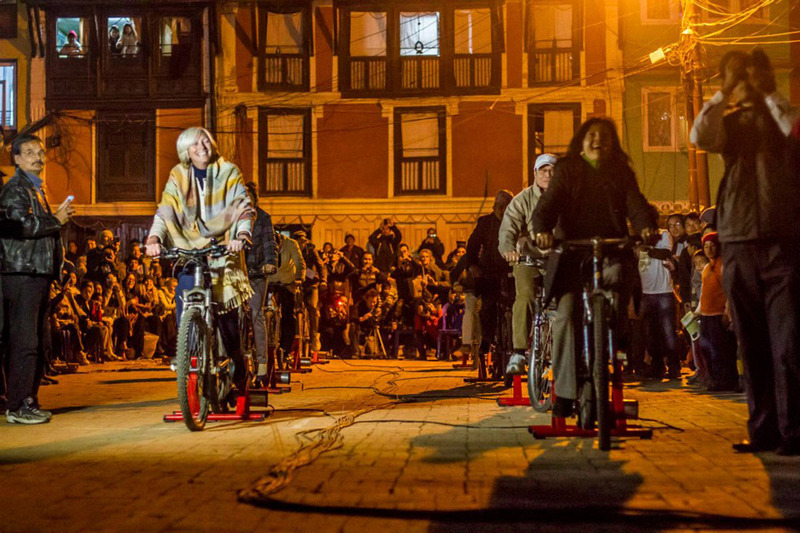 Participants are invited to hook their own bikes up to bike trainers previously transformed into generators. 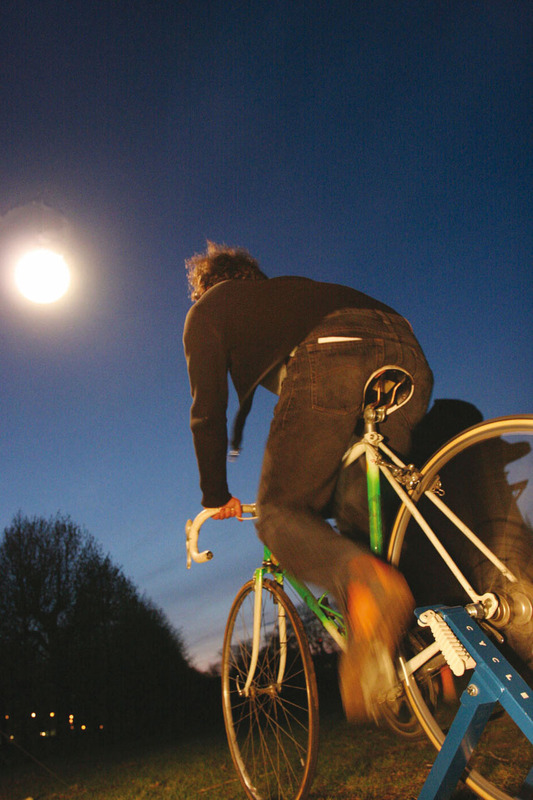 Every step on the pedals generates electricity, illuminating a balloon light hovering in the night sky. 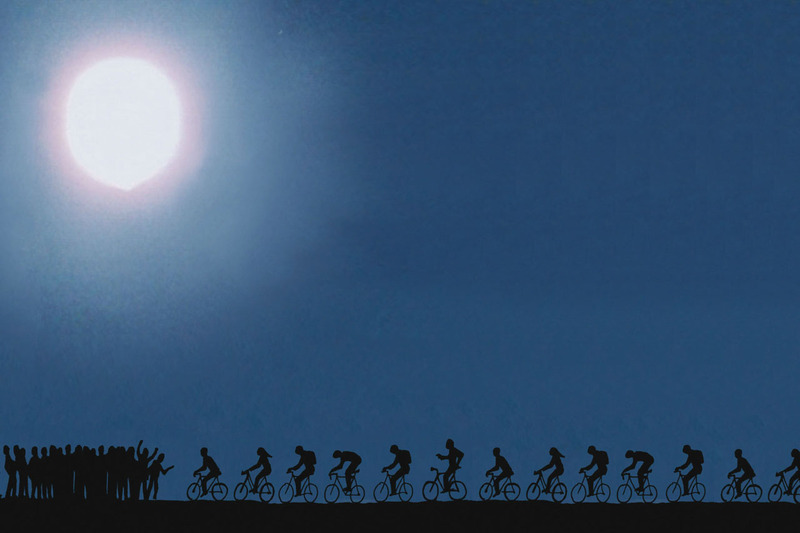 The cyclists’ effort determines the brightness of the balloon. 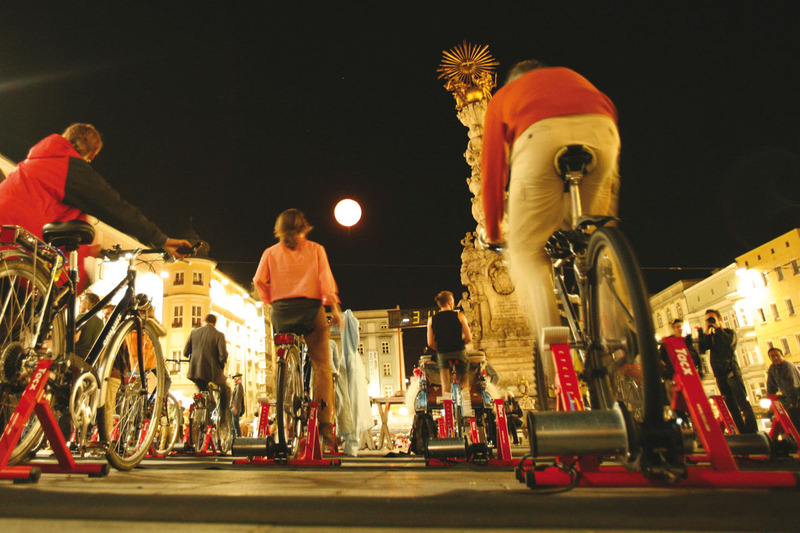 Moon Ride plays on the presumption that there is no light at night without human effort – not even moonlight. It is the physical encounter of a society on its way to another dimension of reality. Moon Ride. Interactive installation. Group exhibition “Citydrift/Detroit”. Abandoned warehouse, Kunsthalle Detroit, Michigan, USA. Abandoned warehouse, Kunsthalle Detroit, Michigan, USA. 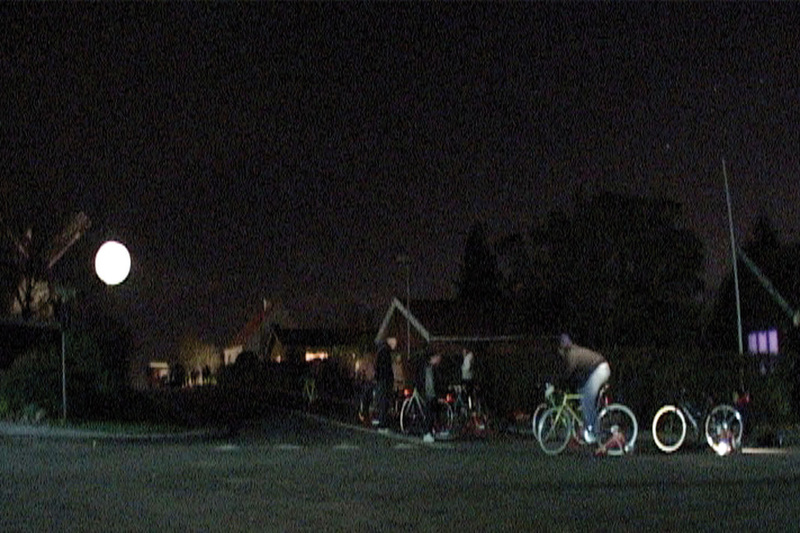 Moon Ride - Citydrift/Detroit, Kunsthalle Detroit, Michigan (USA). Video: Assocreation. Moon Ride. Interactive installation. Group exhibition “Earth, Body, Mind”, 2nd Kathmandu International Art Festival, Nepal. Naag Bahal, Patan (Nepal). Photo: Artudio. Moon Ride. Interactive installation. Group exhibition “Warsaw Under Construction”, Muzeum Sztuki Nowoczesnej. Warsaw (PL). Museum of Modern Art, Plac Defilad, Warsaw (PL). Photo: Museum of Modern Art. Moon Ride. Interactive installation. Machine-RAUM Biennale for Video Art and Digital Culture. Kirkegade and Foren Møllen, Vejle (DK). Foren Møllen, Vejle (DK). Video still: Assocreation. Moon Ride. Interactive installation. Group exhibition “Simplicity”, Ars Electronica Festival. Hauptplatz, Linz, Austria (produced with the technical support of the Ars Electronica Futurelab). Hauptplatz, Linz (AT). Photo: Assocreation. Moon Ride. Performance. Augarten, Vienna (AT). Augarten, Vienna (AT). Photo: Assocreation.